The British Gazette » And a Happy New Year to you too! Kim Jong-un, Chairman of the Workers’ Party of Korea! 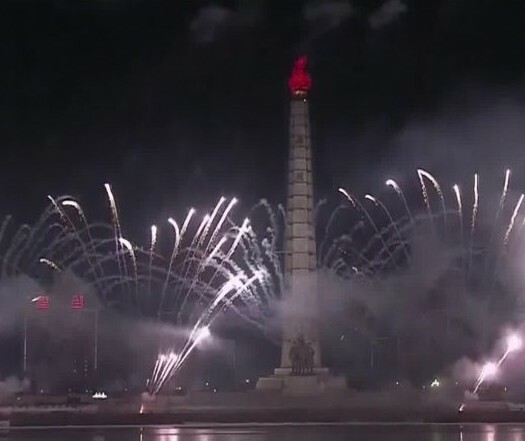 Above, a captured screen-shot image of the New Year’s Eve/Day fireworks display over Pyongyang, DPRK. “9th Jan ~ At this year’s Lent course we are going to explore and create our own Stations of the Cross. Members of the community will also be invited to contribute some art work and all work will be exhibited at [deleted] in Holy Week. Firstly some background here: The vicar is a recent incumbent. He is a very pleasant chap from Germany who celebrated earlier this year his 40th birthday. He has stated that he has “no problem” [his words] marrying “two blokes” [his words] in church. At this point, Dear Reader it important to note that today’s article is NOT about what many call “equal marriage” and we will not comment further on the vicar’s statement. It is mentioned ONLY to make the point that this particular church and congregation and it’s vicar is NOT one of the “bells and smells” Anglo-Catholic churches and consequently my surprise at the mention of doing the Stations of the Cross. As just stated, when I read this I was surprised. This was because doing the Stations of the Cross is something that the Roman Catholics do and insofar as the Anglicans are concerned, it is something I’d expect around Walsingham in Norfolk and not Cornwall. Don’t get me wrong: I’m not being critical of the recently arrived vicar. Just surprised; me being brought up as a Methodist and attending the Anglican church as that is the church that is still open in the village whereas the three Methodist chapels have been closed for years. With New Year’s Eve occurring on a Sunday, these events however recall to mind a conversation with a neighbour that many would regard as wholly insignificant and not worthy of any comment: The incident took place on New Year’s Eve 2012, on the eve of last year (2013) in which lived in Leeds in the West Riding of Yorkshire. This was their reaction because they appeared to be ignorant of much of the tradition of the Christian religion in this country. This person was/is not unintelligent. They are like the recently arrived vicar, in their fourth decade and would describe themselves as “White British” in an ethnic survey questionnaire. You see, this person was brought up in a society that has systematically eschewed much of the Christian tradition of earlier years. For political reasons. Similarly, this person would not “pick up on” the Roman Catholic allusion above. What happened was that this person conflated in their ignorance the purely secular celebration covering the passage of time over a date on the calendar and the deeply religious celebration of God becoming incarnate on Earth. That person’s ignorance is due to all those progressive elements from the “swinging sixties” forward. So… Fast forward to New Year’s Eve 2017! It occurred on a Sunday. Again, there was NO Midnight Mass! Just the service of Holy Communion at the morning service. The two events (New Year’s Eve partying and regular church services) occurred on the same day. So here we come to the reason for this organ choosing the firework display over Pyongyang, DPRK and not the always exceptionally impressive display over Sydney Harbour Bridge of previous years. This is because the Korean peninsular (both sides of the DMZ) is home to a rapidly growing population of Christians. Now, whereas the Christian community in South Korea is free to practise their faith, this is most definitely NOT the case in the DPRK. Which is why my former neighbour, were they to read this article, would likely be aghast at my suggestion to British Gazette readers wish the blood-soaked tyrant Kim a Happy New Year! Now, my aghast former neighbour may well suggest that Mr Kim will “get away with it” [his mass murdering and torturing of his fellow Koreans]. You see, when the disciples despaired when Christ announced He was taking his final Earthly leave of them, He told them that an act of kindness (such as providing food to the hungry) would be as if they were to give a gift of food to Him in person. And the corollary also; that an act of cruelty (such as the many committed on the instructions of Mr Kim) is an act of cruelty would be as if they were to commit an act of cruelty on Him in person. So I think you can see where the British Gazette is going with this! If Mr Kim thinks he is going to “get away with it [murdering and torturing his fellow Koreans]” he is deeply mistaken! Unless of course he plans on not dying! So, Mr Blood on Your Hands Kim…. A Happy New Year!